One Bedroom Has a Queen Sized Bed, With Two Single Beds. All other beds are single beds. Call for availability and booking The Big Cabin. Call for availability and booking The Rustic Cabin. 1 Double Bed, 1 Bunk Bed, and 3 Single Beds. Call for availability and booking Above The Rustic Cabin. Call for availability and booking The Cabana Cabin. Call for availability and booking Above the Dining Hall. 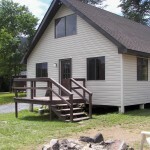 CALL 814-784-3605 TODAY TO RESERVE YOUR CABIN! HURRY, THEY GO FAST! Round out your day at the Breezewood Proving Grounds by coming back to one of our comfortable cabins outfitted with everything you need to for a fun get away.